Night-time on wards, like at home, can be relaxed and satisfying, or deeply fraught and disturbed. Many patients (especially elderly people) require high levels of care, there are many of the same tasks and challenges as earlier in the day and then there are the many other duties and dilemmas particular to the night. Sleep being the obvious one, but many patients (and staff) can have a very uncomfortable sense of darkness, isolation and what can feel like an eery stillness. Staff have to make complex mental and physical health risk assessments, balancing the risk of, for example, insufficient sleep with the need to prevent bed sores. At least half of people over the age of 65 experience difficulty in sleeping with the additional time-shifts that dementia can cause, eg experiencing 40% of their bedtime hours awake and 14% of their daytime hours asleep. As well as tiredness or exhaustion being unpleasant for anyone, older people are at greater risk of difficulties thinking clearly, and of falls, when they aren’t getting sufficient good quality sleep. The references and resources section below has links to websites with loads and loads of other sleep-inducing ideas. But we’d like to pick out just one which seems particularly helpful. People really struggling to get to sleep, and perhaps very frustrated about this, should be encouraged to focus on relaxing, not on sleeping. We can’t fall asleep if we’re busy telling ourselves how infuriating it is we can’t get to sleep, how it’s going to mess up our next day, how our sleep problem is getting worse and worse, it’s wrecking our ability to work etc etc etc. Being reassured that relaxing in bed is also restorative can help to break through the anxiety onslaught. Once the anxious self-talk quietens and then stops, we’re in a much more relaxed state, which is restorative n itself – and also means we’re more likely then to fall asleep. Relaxation techniques (eg visualising a peaceful scene, listening to music etc) can help the person to quiet their mind. This would all suggest that night staff should be particularly strongly trained, supported and valued. Of course the reality is often that the ‘hidden’ nature of night is exacerbated by the apparent invisibility of those occupying it in hospital. Caring for patients at night requires all the ‘daytime’ skills plus expertise in sleep. Plus considerable confidence and courage given the levels of responsibility required and the absence of the daytime managerial and administrative supports. And seriously strong people skills as many patients are also aware of the lack of on-site back-up and need to trust the night team’s professionalism. Of course, for many people, working nights is a very positive preference. Patients really appreciate skilled, caring night staff and these nocturnal shifts allow (indeed require!) enormous professional autonomy. And for some staff, working nights fits in well with family and other commitments. The ideas marked with an asterisk are examples from mental health wards. The others are a mix of things we’ve read, things we think are probably happening but which we can’t confirm and our own ideas. Personal CD players for relaxation music. Sessions on sleep hygiene delivered. OT assistant runs relaxation and sleep preparation group. Patients encouraged / supported to develop routine. The TV is turned off at 12pm to aid and encourage sleep. As a ‘night time’ cue, lights are turned down low at 11pm. Information is provided on sleep hygiene. Relaxation – learning techniques in afternoon then have relaxation session half hour before bed. Encouraging patients to use headphones with CD players, radios and TV. Many younger patients arrive with their MP3 players and this helps keep noise down. Staff that have set personal commitments and hobbies are able to work night shifts. Regular night staff attend ward time-out days. Regular management involvement in night shifts increases management understanding and awareness. Training for night staff is monitored, i.e. appropriate times and conditions for training is provided. Night staff receive regular supervision at an appropriate time. Night times are a set topic of community meeting agendas. A night-time key worker system and detailed night-time care plans. Strategies for consistent communication and support between manager and night staff are in place. 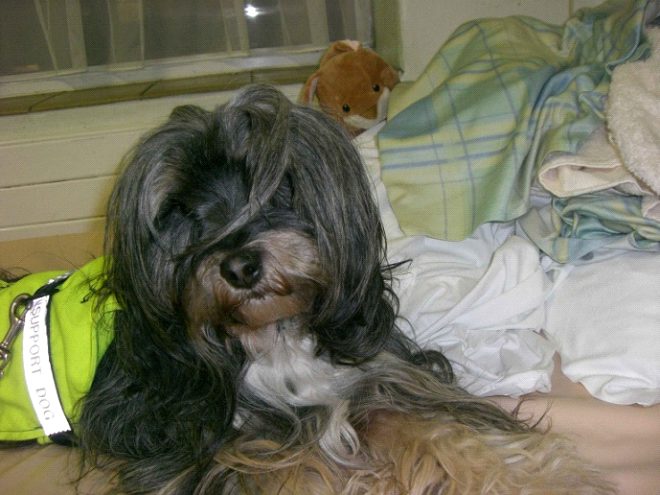 Member of staff is sleep hygiene link nurse. The use of agency and bank at night staff is kept to a minimum. Staff with a familiarity of the patients and the setting are used where possible. Guidance is given to night staff on the impact of night working, i.e impact on health and wellbeing and advice on nutrition and hydration. Night staff are encouraged to do at least one day shift a month to aid team cohesion and decrease isolation. A night key worker system was introduced who completes night care plans. Staff are mindful about disruptive environmental factors such as noise and light. Utilisation of technology, i.e silent call systems. ‘Nod Off’ pack are offered which contain items like, eyes masks, ear plugs, lavender-filled muslin bags. Night staff have been trained in aromatherapy massage techniques. Aromatherapy lavender oils and carrier massage oils. A budget for downloading restful music, self-help downloads and relaxation music. Patients make their own lavender wheat bags. Importance of protected time at night understood. Staff have protected time with patients at night. Patients able to sit with staff for reassurance. Staff who spend time with patients at night not seen as “soft touch”. Patients not made to go to bed. Patients can make phone calls to loved ones. Staff aware that night can be scary for patients. Patients able to sit in lounge. Intrusive practices are done with minimal disruption and are carried out in response to individual needs, not part of a set routine. Staff are mindful about not speaking loudly at night or banging doors etc. Staff try to avoid wearing bunches of keys that can jangle as they walked down the corridors. Volunteers trained in massage utilised to aid sleep. Good range of books on the ward. Area closed off for those who want to stay awake. Basic activity resources like playing cards and dominoes are provided for those who cannot sleep. Exercise classes are provided to aid sleep. Room made available for relaxation. Patients can take warm bath (bathroom not locked up). Reasonable time set and agreed to switch off TV. Attention is given to the light levels when checking or entering a patient’s room and the use of torches has been introduced. The night-time routine is explained to each patient (and relatives) upon their admission. Information sheets have been produced for relatives about night-time care. These aim to prevent relatives from feeling ‘in the dark’ about night-times. Patients bring in own duvet. Patients who wish to stay up at night times are asked to move away from bedrooms and dormitories. Each patient has a night-time key worker who takes responsibility for duties like night-time care plans, and the communication to other staff of the patient’s needs etc. Night staff complete a handover summary sheet every night. This details significant information and progress relating to each patient. The sheet is taken into each day time handover. Structured and inclusive morning handovers improve relationships between day and night staff, and lead to improved communication of patient’s care. Provision of extra staff in the period from 6am to 9am facilitates a smoother transition between the night and day shift. Plug in or battery powered room diffusers with lavender refills. Resources (dried French lavender and material) for making own lavender wheat bags. ‘Sleep stones’ infused with lavender oil. Large quantities of herbal teabags for restful sleep. 4 night staff per ward to be trained in aromatherapy massage techniques. Downloading restful music, self-help downloads and relaxation music. Thanks to the dynamic OT Sarah Wilson, Northamptonshire have kindly shared their incredibly helpful sleep resources. These are below in the Resources section. The TV got turned off at midnight but if there was a film on that finished after this time staff let us watch it. My post dinner chats with other patients are my fondest memories of being on the ward. I often felt misunderstood so at the end of each day the staff would ask me if I felt like there was anything we needed to talk about and go back over. It meant I could go to sleep without worrying about everything. I was admitted at three AM so the first night wasn’t all that good. When I woke up in the morning I expected the worst. Instead I was greeted by a nice student nurse, who spent a lot of time with me. A cup of hot chocolate before bedtime was my favourite thing. I would drink it slowly and savour every mouthful. It would set me up for a good night’s sleep – as well as the medication of course! Evening chats on the sofa about our dreams, goals, ideas & aspirations keep them alive. It is always a sparkling, special time. I found a lot of people just needed a few nights sleep. Seems to be a thing with mental health. You get to a point where you’re either in overdrive or at rock-bottom because you haven’t slept for weeks or months. The ward gave me a place to rest, relax and sleep. That was a huge part of my recovery. Like respite. 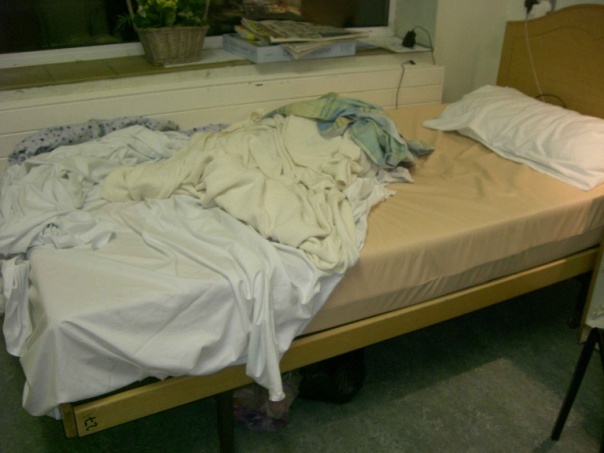 This is a photo of my bed, a few admissions ago. It, er, neatly illustrates the problems of having waterproof mattresses combined with undersheets which are too small. I can vouch for the discomfort of spending the night lying directly on a plastic mattress with a jumble of bedding scrunched on top of me! Still on the bed linens’ theme, during those admissions when I was in for more than a week, a friend would bring over my duvet cover from home. This (along with photos, cuddly toys, books etc) makes her ward bedroom feel more familiar and homely. Some people also ask relatives to bring in their favourite pillow as well as the more obvious nightclothes. Your ward’s particular layout, design and features (and age!) make a huge difference to night-time disruptions. A good relationship with the estates’ department usually helps with swift repairs to noisy ﬂoorboards, plumbing and doors. The problem of noise levels is exacerbated for people with dementia, who have a decreased ability to ﬁlter out unwanted noise (Jacques and Jackson) and this can lead to increased anxiety and agitation. Noise made by staff walking, talking and using equipment (eg trolleys, phones, printers – and of course alarms). Even a quiet voice or sound can wake a light sleeper, especially if it’s right outside their door! There really does need to be a ‘night-time voice volume’. Noise made by patients. Music, mobiles, chatting, calling, crying are all continuous features of ward life, but unless a patient is very disturbed or cognitively impaired, most are very amenable to keeping the noise down in order not to disrupt others’ sleep. dim lights in communal spaces before bedtime, as a signal that it’s a good time for people to start getting ready for bedtime and sleep. using a gentler or more limited light when checking on patients – eg torches or offering patient the choice of a having a low-key night-light on. movement-sensitive lighting systems produce dimmed lights til someone is ‘in the zone’ when they brighten so the person can see where they’re going and what they’re doing. New hospitals mainly have en-suite bathrooms, which greatly help not only with privacy and comfort (and it feeling pleasantly hotel-like) but with having an individualised level of lighting. There is an undoubted art to checking that a patient is safe and comfortable at night in a way that minimises the intrusion and the risk of waking the person, and provides a reassuring presence if the patient is woken up. This is especially important with incontinent patients and night-staff should lead the care planning about the balance between keeping the patient being dry and their need to sleep. For example, night staff should contribute to the assessment of patients’ night-time needs as part of their individualised night-time care plan, which informs how often and how best to carry out night checks for each person. The Rowntrees’ report included the following: One man made a distinction between staff opening the door to check and coming into his room, which he experienced as an invasion of his space. There are increasing technological solutions that can make checking on patients’ well-being at night less disruptive, such as bedside motion detectors. How to respond to patients who are awake is an ongoing dilemma for night staff. The top of the list of recommendations in the Rowntree’s report is not uncontroversial! 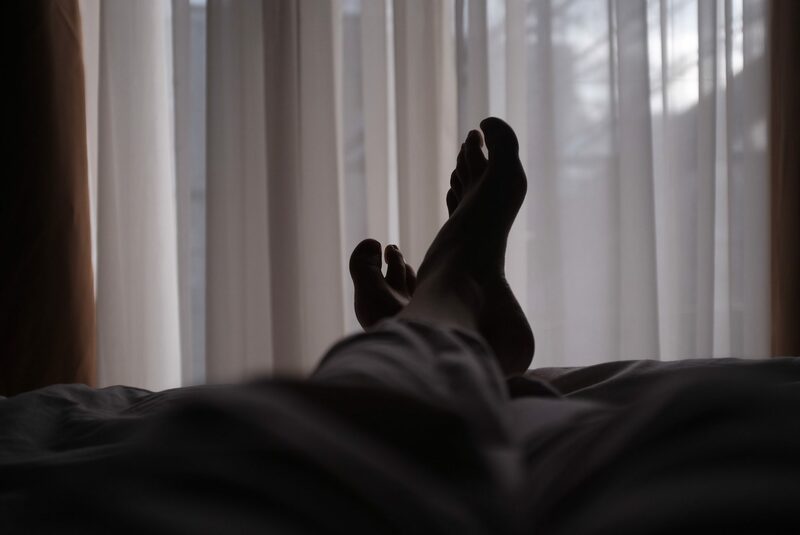 “While sleep is an obvious objective of good care at night, this can also be a time when a range of beneﬁcial and effective care practices can be carried out.” This is a view we strongly endorse. The reality is that a significant percentage of patients are awake much of the night. For some patients, it’s best to stay in bed trying to relax and get to sleep. But for others, this is either simply impossible or creates excessive frustration and perhaps agitation and gentle activities from a game of Scrabble to some companionable TV watching can be a constructive option. It’s very common for patients to wait til the evening, when the ward is quieter, before they open up about how they’re feeling and these night-time conversations can be particularly valued by both patients and staff. Provide relatives with an information sheet about basic expectations relating to night-time care. Include up-to-date photographs of night staff as part of the information. Inform relatives of the resident’s night-time key worker and encourage some form of regular communication between them. Have regular meetings for relatives to improve communication and information sharing.